As you already know, I am a big Boston Pizza fan and this year, Boston Pizza turns 50! To celebrate - they have a few surprises in store! In celebration of their Golden Anniversary, they have released a few new items on their 50th Anniversary Menu, including Popeye Pizza, made with spinach, roasted garlic, mozzarella and feta cheese, as well as the Sombrero Pizza, made with a combination of refried beans, crushes chilies, taco beef and mozzarella cheese topped with cheddar cheese, lettuce, tomatoes and drizzled with ranch dressing. 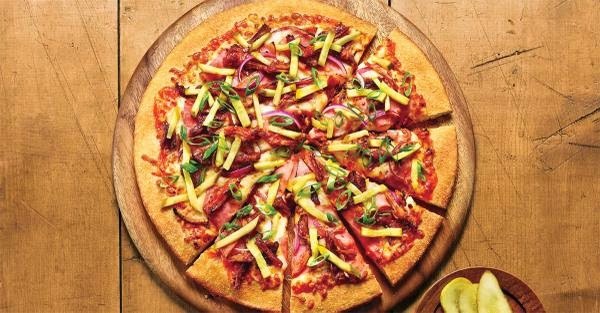 New to the menu includes the California BLT Thin Crust Pizza, with mozzarella, bacon, tomatoes, arugula dressed in balsamic and guacamole mayo, and the Cubano Pizza which is a sandwich-like pizza with sliced ham, pulled pork, mozzarella, red onions and a spicy honey mustard. "What's for dessert? ", you ask? Well, not to worry - Boston Pizza has you covered on this end as well! 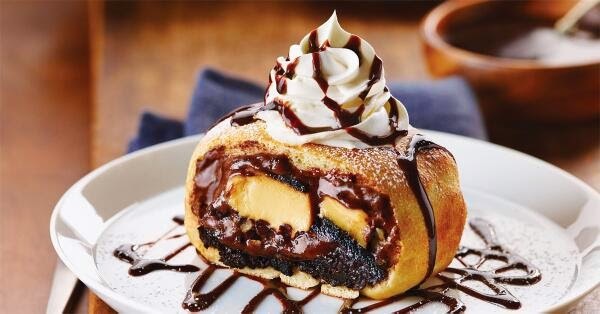 Insert - the Chocolate Doughcano, chocolate mousse with bits of cheesecake, toffee, pecans, caramel and almonds all wrapped in Boston Pizza's signature pizza dough. Umm, hello - delicious! ENTER MY CONTEST TO WIN A GIFT CARD AND A CHANCE AT A $2,500 BP PIZZA PARTY! The deliciousness doesn't end there! Boston Pizza also has a specially crafted "Golden Anniversary Pale Ale" that was crafted specifically for Boston Pizza by Molson Coors Canada. They also have two new mojitos on the menu, the Arctic Mojito and the Lemon Tea Mojito. You can head into any Boston Pizza and try out these new menu items and you will be given an entry code to enter to win a chance for a $2,500 BP Pizza Party! You can even earn the entry codes if you opt for a stay-at-home meal and have Boston Pizza delivered! The BP Pizza Party will give you the chance to spend up to $1,500 on BP food and $1,000 on entertainment. Now - THAT'S a great party. Side note: If any of you win, I fully expect an invite! On August 12th, Boston Pizza's official anniversary - you will be able to celebrate in-store with all individual sized pizzas being priced at only $5. This is gong to be offered at all Boston Pizza locations across Canada. "From heritage menu items to new innovations in pizza, a signature anniversary beer and $5 Indy pizzas on our birthday, we're giving guests the chance to celebrate with us throughout the summer in a big way," said Silverstone. "Then, we'll celebrate with them at their very own pizza party featuring Boston Pizza food and maybe even the epic Pizza Cake for a few lucky contest winners." I want to help YOU get into a Boston Pizza and celebrate their Golden Anniversary. Enter below for your chance to win a $25 Boston Pizza gift card!